This past weekend (March 4-6), the Cool Springs Primitive Baptist Church in Danville, GA hosted her annual March Meeting. We are pleased to report that God was once again merciful upon our band, and the weekend will find a lodging place next to so many others as a rich memory of God’s abundant goodness unto us. In the tumultuous world in which we live, the times seem to keep changing and mostly for the worse. However, weekends like this past one are evidences that not only does God exist in a very real and powerful way, but He is not through with His people on earth. Thank God that He is so good to us! Though Satan’s darts are flying all around us, there is still a place of quiet rest near to the heart of God. Most of the church seemed to be in the midst of a busy season – my own house included. Many of the members talked about the busy-ness of life that made them look forward to the meeting all the more. Then, the week of the meeting, my life got even busier as I received the call that no minister wants on the week of a meeting. The church had invited and planned for Elder Mark Rowell from Fort Worth, TX to be with us. His first granddaughter had other plans though. She decided to arrive a few weeks earlier than expected causing Brother Mark to have to cancel his plans to come and be with us. Since this all happened a mere 2 days away from the meeting’s beginning, my prayer life increased even more! With the Lord’s help, we were supplied even on short notice. Elder Chris Crouse and Elder John Scott agreed to come and preach for us, though the church was still stuck with her pastor on Sunday – bless their hearts! From the spirit of the meeting as felt through the attendants, all seemed content with the outpouring regardless of the change of arrangements. Elder Scott alluded to this in his sermon while quoting a grandmother in Israel, “The older I get, the less important the messenger is and the more important the message becomes to me.” Amen! Several of our deacons told me throughout, “It’s going to be fine. Everyone’s being fed.” Visitors came and expressed their feelings, “The Lord handled it, and He still takes care of His people.” Being that we had lived through a sudden shift change of arrangements it was interesting and providential that the messages of the meeting seemed to hinge on God’s dealings with His people in the here and now. Though we rejoice greatly to know that we will be with Him ultimately some sweet day, it is the daily benefits and timely deliverances that show us glimpses of His ultimate deliverance for us. Each daily mercy and timely grace is sufficient evidence that what He has promised that we do not yet see is real and unchangeable. As the meeting came to its close, we felt again the weakness of the flesh and recharging of the spirit. Tears flowed during the day on Sunday, and some still did not want to leave the grounds on Sunday night even though the meeting had ended. We extend our heartfelt thanks to our kindred in Christ that came to visit and worship with us. As always, we are humbled by your labours of love and fellowship. We feel humbled most of all by the love and fellowship of our God who still stoops down to be us and wrap His arms around us. May His house continue among us with our lights burning and our feet shod. Preaching: Elder Chris Crouse – “God is a God of the Living” Brother Chris expounded from Matthew 22 in Christ’s reply to the Sadducees. Though the resurrection was a farce to them, Christ showed that in and through the resurrection, God is not praised by dead men but by the living and should be praised as such today by those that have been made alive by His power and mercy. Preaching: Elder Chris Crouse – “God of Our Righteousness” Brother Chris started in Psalm 4 as David petitioned God acknowledging Him as the source of goodness in himself. From there, Brother Chris continued to show that anything worthwhile we have was given to us by God, and our duty is to show and reflect that back to Him in praise and service. Preaching: Elder John Scott – “Christ and His Church” Brother John expounded from Ephesians 5 and showed that the marriage between man and woman is a reflection of Christ and His church. While extolling the Master and His bride, Brother John showed how much the Heavenly Husband thinks of His beloved and how special she should be to us as well. Though little esteemed in the eyes of the world, she is prized to Him. 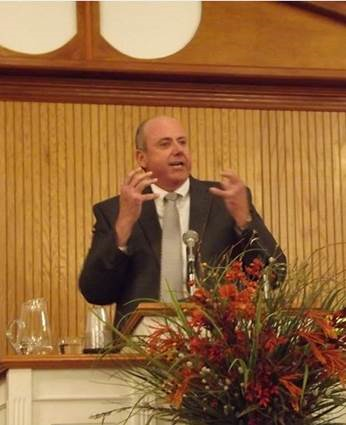 Preaching: Elder Philip Conley – “The First and the Last” Brother Philip talked from Revelation 1:8-20 about the Person of Christ and His interaction with His churches. Though things around us change, Christ does not and is the Alpha and Omega. Due to His unchanging nature, His care and affection for His churches remains and endures as well. Though Satan assails, the church will endure, and one day we will all live in harmony together triumphantly with Him. 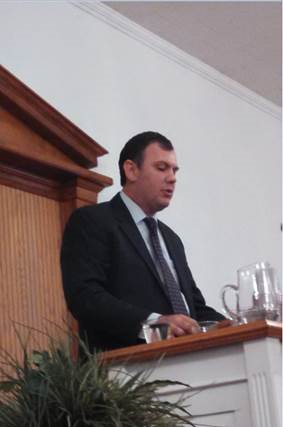 Preaching: Elder Philip Conley – “Sanctifying God and Being Ready to Answer” Brother Philip took I Peter 3:14-17 and dwelt mostly on Verse 15 about putting the Lord first and foremost in our hearts. With this mindset and affection, we are prepared to answer others about what we believe, feel, and hope for the future. We fully hope (expect) to live with Him one day with nothing between now and then changing that. We should be ready to answer where our bright hope comes from and why we hold to it. Even if we suffer for it, it is worth holding on to and cherishing. The sermons will eventually be uploaded to our website (coolspringspbc.org) for those that would like to listen to them.